In 1906, Oklahoma, New Mexico, Arizona, Alaska and Hawaii hadn’t yet entered the Union. The cars of the time were spindly, horse carriage-looking things with spluttering engines. They shared the road with actual horse-drawn carriages. And 1906 wasn’t even that long ago. 1906 is significant in this case because it was the year that A Trip Down Market Street Before The Fire was filmed in San Francisco. It was shot from the front window of a cable car traveling down Market Street, according to the Library of Congress. 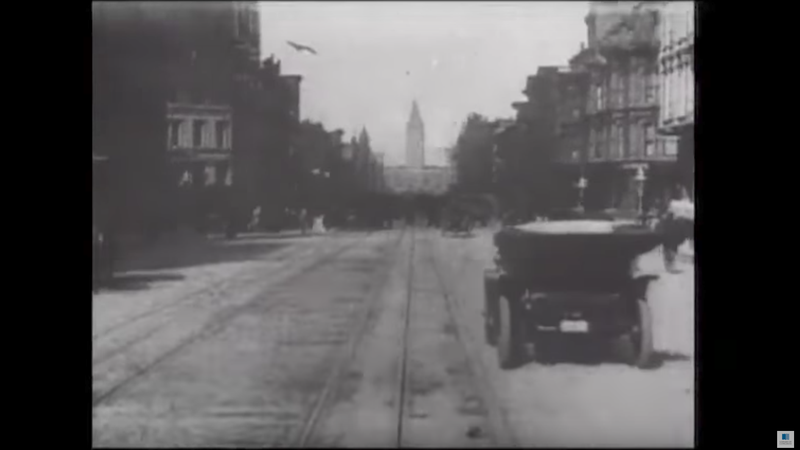 It captures the city and its downtown area before it was destroyed in the 1906 earthquake and fire. It’s kind of cool to think of San Francisco in this way, as 111 years later, San Francisco is now seen as the hub of our technological future. We covered this video once before, but that was in 2009, which was, like, when dinosaurs roamed the Earth. It’s cool and you should watch it.